When thinking about GPS (Global Positioning System), if you’re still thinking of a portable device that handheld or fit into your car that will instruct and give you navigation direction to almost anywhere on the world, then you probably need to know about GPS tracking too. GPS tracking is one of the consumer application for the GNSS (Global Navigation Satellite System) to determine the location of a vehicle, person, teen, pet, fleet, freight, or other asset and to record the position at regular intervals in order to create a log of movements. LandAirSea GPS Tracking Key is one of the GPS tracker available in the market. LandAirSea GPS Tracking Key is a small, pocket sized device that receives signals from U.S Department of Defense satellites orbiting the earth, forming the only free complete working GPS system in the world currently. The tracking key can accurately determines the current location and coordinates of the device within 2.5 meters error margin and able to records the location data at the frequency of every second. The data recorded can then be transferred to computer via USB port, and with the included LandAirSea GPS Tracking software or Google Earth which is fully supported, users can accurately determine where a person traveled, how fast they drove, where they stopped and for how long. The recorded data from the GPS Tracking Key can be displayed over a street map, satellite images or in a text report with comprehensive information. The main feature of the LandAirSea GPS Tracking Key is its small size, which is easily concealable, making it as an good investigation device to track movement of people. Best of all, the tracking key comes with a strong magnet which allows for instant mounting, and is water resistant. Thus users can place the tracking key anywhere, including pasting the key underneath the bottom car frame. LandAirSea GPS Tracking Key is powered by just 2 AAA batteries, which will last for about 20 hours of usage. And the internal memory can save about one month of data. Operating the tracking key is extremely easy, simply put in the batteries will do. Track your teenager to see if he is driving recklessly or where they are going. Track where your spouse or boyfriend/girlfriend going if you suspect them of infidelity. Check if employees using the vehicles for personal use. Log the travel history of your limos, taxis, buses or other commercial vehicles. Tag the photos for the location the photos is captured. LandAirSea GPS Tracking Key costs $299.00 (list price) and ongoing promotion will have $70.00 instant rebate with discounted price as $229.00. 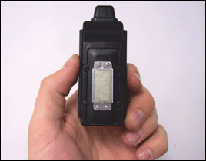 The device can be bought online at vehicle-tracking.com (no longer available) or you can search for a dealer near you here. Note: This is a paid review.